Professional Service providers are keenly aware of the importance of the customer relationship. It is important to be able to provide customers with complete, accurate information about project status. If a project has fallen behind, it is important to inform the customer in advance and discuss options. Too often, bad news gets buried until it’s too late. The way to unvoid this pitfall is to manage professional service delivery using the proven tools of project management, rather than the spreadsheets and desktop productivity tools that are more frequently seen in this space. What deliverables are due in the next month? Has our on-time performance changed during the course of the customer relationship? Are team members working more hours than we are billing? How has the scope changed over the course of time? What opportunities have arisen that we can discuss further with the customer? Project.net will also provide you with structured, reliable information you can use to keep your management up-to-date as well as make sure you are on track to meet customer (internal or external) requirements. Many project managers have learned the hard way that getting team members to track their time and report their progress is a surprisingly thorny problem. Yet team-entered data is by far the most accurate way to track project progress and manage resources effectively. Project.net is designed to maximize team adoption of tools, as well as to provide as much value as possible while adoption is ramping up. Project.net's tools are easily accessed from the personal dashboard. Our tools deliver value right away, and become more reliable and accurate as team members come to rely on the productivity and collaboration tools offered by Project.net. Create a project template that you can use for your active customer engagements. Our Project Workplan module is flexible, so that you can describe tasks in the amount of detail that works for you and your team. As your project progresses, you can update your plan and flesh out details. 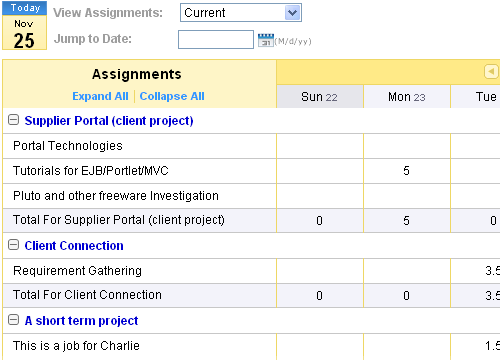 Populate Project Workplans, so that all current engagements are being tracked. Both relationship managers and project managers should participate in this process. Train team members to use Project.net tools, with an emphasis on issues particularly important to delivering professional services, including time tracking, progress tracking, scope issues and roadblocks. Enjoy your greatly increased visibility into the progress and success of your projects. You can drill down with the finest levels of granularity into the current state of the project and understand how it got there. You can generate reports for yourself and your customer to guide the engagements to successful completion.